I believe my work as an ethnoecologist contributes significantly to making important voices (often unheard) amplified to a larger audience that seeks solutions for the present environmental crisis. I am an emerging ethnoecologist, born and raised in Curitiba, southern Brazil. Core-é-tuba, “the land of many pine nuts or trees” (Araucaria angustifolia (Bertol.) 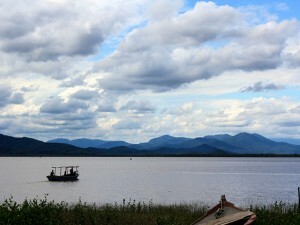 Kuntze) is how the first peoples of the region called the place. Curitiba is known worldwide for its eco-friendly urban projects and substantial relicts of Mata Atlântica Rainforest. Most of my education and life experiences were embedded in this environment, coupled by numerous incursions into the rural countryside, where my parents grew up as farmers’ children before moving to the city. I graduated in Biological Sciences at the Universidade Federal do Paraná. Halfway through the degree, I spent three months in northern Mozambique that broadened my worldview greatly and shaped the future of my research interests. Living among the Makua, Makonde and Moni peoples increased my awareness of how political, social and economic issues influence conservation and people’s dependence on natural resources for their livelihoods and well-being on a daily basis. My experiences in Africa humbled me and instigated a quest for a more holistic perspective on my academic endeavours. Then, back in Brazil, I began my initial steps in ethnobotanical research, participating in fieldwork activities in coastal Caiçara communities and assisting graduate students’ projects at the university. Later, I joined an interdisciplinary project for the elaboration of a management plan for one of the most important Araucaria Forest reservations in Brazil, as an intern with the Brazilian Agricultural Research Corporation Forest Division (EMBRAPA Florestas). I worked on the ethnobotanical segment of this project, which became my honours thesis. During this time, I was a member of Oikos Ecology Lab at UFPR, and took part in the organisation of workshops, round tables, seminars and conferences. Shortly after graduation I was hired as an environmental sciences teacher at a renowned eco-school in the Curitiba region, where I worked for about a year developing an annual curriculum and teaching children from 10 to 13 years of age. I also continued as a volunteer researcher in ethnobotanical studies. For the last three years, I had the privilege of living in Canada’s west coast, pursuing higher education, including a master’s degree from the School of Environmental Studies at the University of Victoria. 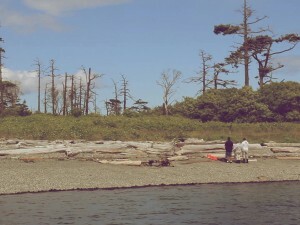 I was under the supervision of distinguished ethnobotanist Dr. Nancy Turner and school director Dr. Eric Higgs, working closely with a local First Nation on the restoration of their home-islands ecosystems. While in Canada, I had the opportunity of sharing my research work in different venues and participating in several scientific meetings. These experiences provided me with fresher perspectives on academic excellence and social engagement. My recent experience as a GESA 2013 participant was instrumental in repositioning perspectives about my own work and career, as well as allowing for unique networking opportunities and broadening possibilities for the present and near future. Now, I am back in Brazil, based in Florianópolis, highly motivated to continue my studies and research as a PhD student in Ecology at the Universidade Federal de Santa Catarina. I also serve as scientific advisor for a local and international conservation organisation, A Rocha – Brasil. My current research is aimed at social-ecological change in the cultural landscapes and ecosystems of the Xokleng Indigenous People in southern Brazil. In December 2013, Thiago received the 2014-2015 Darrell Posey PhD Fellowship for Ethnoecology and Traditional Resource Rights for his work with the Xokleng Indigenous People. 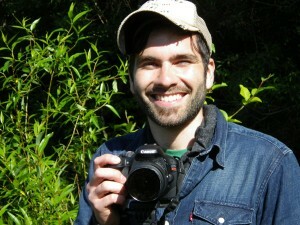 This fellowship will help support initial phases of his research project ‘Cultural Landscapes and Biodiversity: social-ecological change and local strategies for resource management and conservation in the Laklãnõ (Xokleng) Indigenous Territory, Upper Itajaí Valley, Santa Catarina, Brazil’, as well as promote associated activities within the local community for raising engagement and supporting local initiatives. 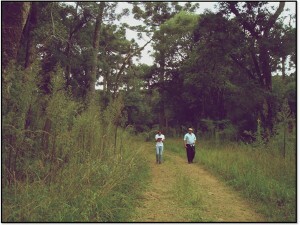 Ethnobotanical walk in the Araucaria Forests of Southern Brazil with Mr. Oswaldo Rupel, local resident and farmer. Araucaria Forests are part of the Brazilian Atlantic Rainforest, with less than 7% remaining of the original cover. 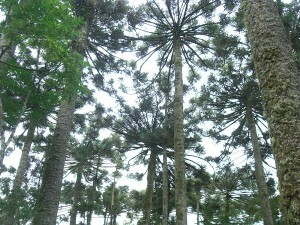 Araucaria Forest canopy. 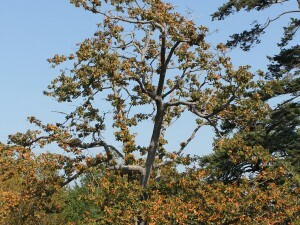 Dominated by Araucaria angustifolia, now a protected species. Araucaria trees are a cultural keystone species in Southern Brazil, and its pine nuts are staple food for locals during winter time. 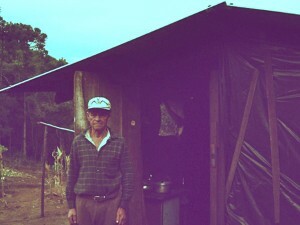 Mr. Alvino Lourenço, resident and knowledge holder of the Arauracia Forests in Southern Brazil. Tl’ches, or Chatham Islands of the Lekwungen people. Welcoming prayer and blessing by local elder Joan Morris and youth, before guests land in these sacred grounds. Chatham Islands, British Columbia, comprise of important remnants of the most-at-risk terrestrial ecosystem in Canada, the Garry oak ecosystem. Only 5% of the original cover is left. Ethnoecological restoration research team in Chatham Islands. 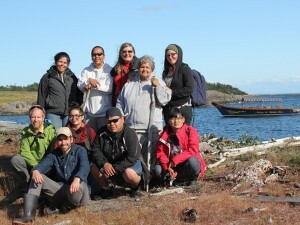 Back row: Cara Barter (University of Victoria Research Assistant), Wilfred George (Lekwungen Community Garden Coordinator), Dr. Nancy Turner (University of Victoria), elder Joan Morris – Sellemah (Songhees First Nation), Ellie Dion (youth worker). Front row: Dr. Eric Higgs (University of Victoria), Thiago Gomes (University of Victoria), Bonnie Quaite (youth worker), Sandy George (youth worker and Community Garden volunteer), Anna Hong (Community Garden volunteer). 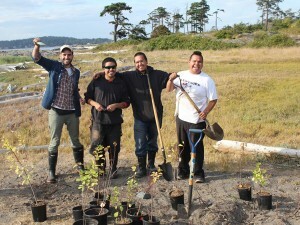 Transplanting some island-grown heritage plum saplings with Lekwungen George brothers in Chatham Islands. Filming with the Lekwungen in Tl’ches – Chatham Islands. 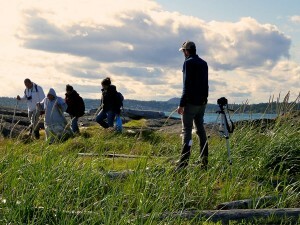 Traditional Ecological Knowledge interviews. Garry oak (Quercus garryana), on rocky outcrop in Chatham Islands. Coastal Atlantic Rainforest. Looking out to Guaraqueçaba, Paraná, Brazil. The region is regarded as a Natural Heritage Site by UNESCO, and is home to local Caiçara communities and Guarani indigenous groups.